Gonzaga will probably run into zone defenses next week at the PK80 Invitational in Portland. The Zags won’t go into the prestigious holiday tournament unprepared. 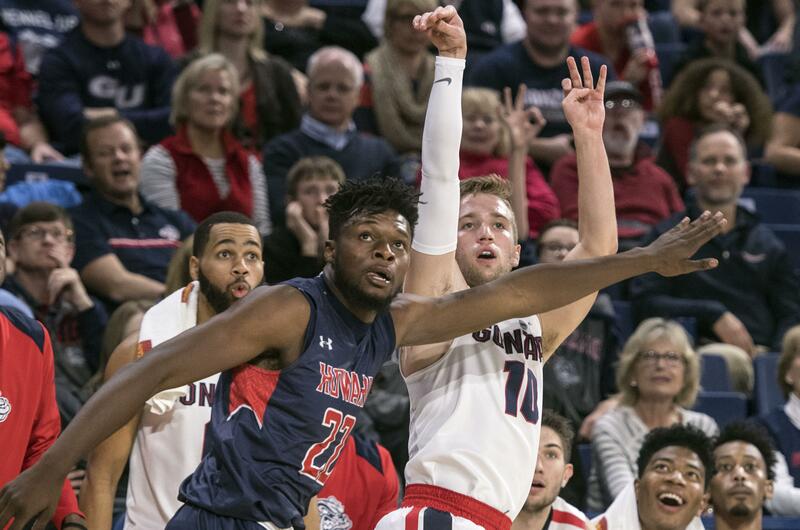 The 17th-ranked Zags took a long test drive against Howard’s zone in a 106-69 victory Tuesday at the McCarthey Athletic Center. Texas Southern also slapped a zone on Gonzaga at times in last week’s season opener. The Bison were aggressive on the perimeter, springing traps, and also tried some modest full-court pressure. It wasn’t much of a test with the 37-point final margin, but it did afford the Zags plenty of time to refine their zone offense. Gonzaga struck from distance early with a pair of 3-pointers from Josh Perkins and Corey Kispert. The Zags moved the ball well and had no trouble finding open shooters. They piled up 10 assists and 39 points with 7:24 left in the half. Gonzaga easily handled Howard’s early full-court pressure. When the Zags’ shots didn’t fall, they pushed the Bison around on the boards. Freshman center Jacob Larsen had three of Gonzaga’s 11 offensive boards in the first half. GU finished with 16 offensive rebounds – there weren’t that many to retrieve with a 57-percent shooting clip – and 20 second-chance points. The only hiccup of the first 20 minutes was five charging fouls accounting for five of the eight turnovers. The Bison went man-to-man at the outset of the second half, but it was hard to tell because Gonzaga repeatedly beat them down the floor in transition. The Zags made 14 of 35 3-pointers for their second game with double-figure 3s. Perkins, Kispert and freshman guards Zach Norvell Jr. and Jesse Wade all had three 3s. Norvell turned it around after missing all five of his first-half attempts. He made 7 of 9 shots in the second half, scoring 17 points in 13 minutes. The Zags didn’t abandon their interior scoring. Larsen handed out four assists as he connected with cutters in the lane. Williams had four field goals in the paint and went to the foul line 11 times. Published: Nov. 15, 2017, 4:18 p.m.